To provide quality care to our O’odham in thier home in partnership with the client, family, and community by assisting our clients to restore health , wellbeing and independence as long as feasible. We achieve this through clinical services, education, prevention, support, and monitoring while showing respect and kindness through cultural sensitivity and confidentiality. Being a trusted, self sustaining provider of quality Home Health services for the O’odham. 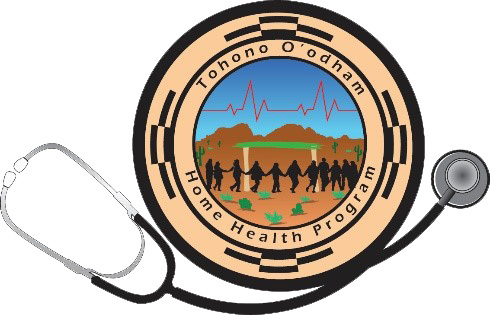 The Home Health Program provides skilled nursing services to clients in their home with a consult initiated from the Primary Care Provider (PCP) within Tohono O’odham Nation Health Care (TONHC). Skilled nursing is provided to Tohono O’odham tribal members, who must reside on the Tohono O’odham reservation. Nursing services are provided by Registered Nurses (RNs), Licensed Practical Nurses (LPNs) and Certified Nursing Assistants (CNAs), whom practice within their scope of work. Arizona Long Term Care System (ALTCS) clients, which is approximately 30-40%. The program goals are to provide quality health care to clients in the home and to meet or exceed performance measures. Future goals include having all vacancies filled to provide an expansion of care to the outer communities and serve more clients in their home. As of January 2018, there are a total of five (5) Home Health employees that include: One (1) Registered Nurse (RN), Two (2) Licensed Practical Nurses (LPNs); and two (2) Certified Nursing Assistants (CNAs). Currently there are two (2) Registered Nurse vacancies.